Whether you are listing your home during the Spring Market, the height of summer or need to put your home on the market over the winter, there are certain ways to obtain more offers on your home and in turn, allowing you to reach your end goals and desires. Potential buyers will make a mental list of all of the items that need to be repaired, cleaned or replaced. By taking stock in that list on your own, before the home is listed, you’ll remove objections, and in turn present a property that is more likely to receive offers! Invite a neighbor or friend over to your home to take a walk through and ask them to be especially mindful of items they might see as barriers to a potential buyer. Take note and consider implementing their suggestions. Staging - on your own - is one way to save money during the listing of your home. Many Realtors have relationships with professional stagers and consultations can be arranged for anywhere from $200-500 to provide a one time visit, and follow up report. This consultation provides a to-do list you can then tackle on your own. While it may seem as though rooms will appear bigger if you push your furniture up snug against a wall, the opposite is actually true. Pull your couches and loveseats away from the wall, at least 4-6 inches. Consider forming an area with your seating arrangement - imagining that you are providing an opportunity to have a conversation. This type of arrangement invokes a feeling of welcome and warmth. While you are in the process of packing and purging your home, the last thing you wish to do is pull all of your family memories and artwork from the walls. Not only does it leave unsightly nail holes, but you’ll also then need to store those frames somewhere. Instead, consider adding a piece of simple decorative paper to those same frames - simply laying the paper over your family photo. This provides instant art that is appealing to more buyers, and removes the personal impact, allowing prospective buyers to envision their own artwork on those same walls. If you have pets in your home, it is an absolute must that you not only hide away litter boxes and traces of your four leggeds during the photo shoot for listing photos, but also for showings. If you cannot take your animals with you during showings, consider providing a designated room for them to huddle in while prospective buyers take a look around, and be sure to leave a note on the door letting visitors be aware. Plan ahead for the maintenance of the exterior of your home. If you’ll be listing the property during the winter, consider engaging a snow removal company to ensure your walks and driveway will always be ice and snow free. If you are listing your property this coming spring, make the effort to plant some bulbs now for a bright pop of color come springtime. You know those squeaky doors that have bothered you for so long? Now is the time to take some WD-40 to the hinges. Entering your home with an accompanying c-r-e-a-k may be offputting to a prospective buyer, and making sure that all doors open easily and without sticking is also a great idea. Buyers are purchasing more than just the home and what is inside of those “four walls.” Consider providing your Realtor with relevant information about your neighborhood, including nearby parks or walking trails. Have some favorite local businesses you enjoy frequenting? Gather their menus or coupons to leave at the home for prospective buyers. If there is a neighborhood association or a community organization they can join, provide that information as well. A little effort goes a long way in helping buyers understand the bigger picture of the community they are considering making their home. Bonus! Even the most conscientious of housekeepers can stand to have a professional come in to deep clean prior to listing a home for purchase. Having the carpets shampooed and every nook and cranny touched by someone who doesn’t see the home day in and day out is well worth the expense and the day away from your home. Book yourself some time with friends or schedule some much needed errands and let your home put its best foot forward - sparkling and clean! 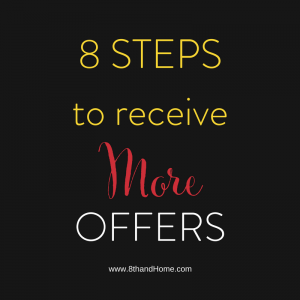 By implementing some of these suggestions, you are bound to receive more offers on your home, and can be proud of your home when you place it on the market! For more tips and tricks when selling your home, visit our Sellers Portal, with content written just for you!